Let our Superhero Wallets Look After your Cash! We're huge comic book fans here at Gadget Inspector and we've never attempted to keep that fact a secret. In fact, we embrace our geeky sides, and we'd heartily encourage everyone else to do the same! Among the many, many superhero-related items you'll find on our fabulous gadget website, we have a small selection of sensational Superhero Wallets. You'll see two of them in the picture above; there's the brilliant Batman wallet (the menacing stare of the Dark Knight will surely discourage any potential thieves), and the smashing Superman wallet (a slightly more colourful option, but no less manly). Either way, you'll feel super-heroic every time you pay for something! But here's the best news: we're currently running special offers on both of these brilliant products! The Superman Wallet is our current Deal of the Week, meaning that you can get it for less than half price if you move quickly (not necessarily faster than a speeding bullet...but yeah, reasonably quickly). The Batman Wallet, meanwhile, might not cost you anything at all - enter our Gadget competition on Twitter and you could win one for absolutely nowt! Whether you're bonkers for Bruce Wayne or crazy for Clark Kent, Gadget Inspector will always have an awesome place for you to keep your cash. Need Stag Party Ideas? There's a Site for That! Now, in fairness, quite a few of Gadget Inspector's products would probably come in handy on a stag night. We've got drinking accessories, fancy dress costumes, and if you want your bachelor party to have a slightly surreal edge, a Flying Shark. Plenty of fun for stags of all sorts, we're sure you'll agree. But why would you shop for your stag night bits here when we've got a whole other site dedicated to that sort of thing? stagstuff.co.uk is our newborn sister site (although 'brother site' would perhaps be more appropriate), and it's the perfect place to go if you're organising a stag do for yourself or a friend! We know how stressful it can be - there's a lot of pressure on the party organiser to really knock it out of the park - so pay stag stuff a visit today and fill your boots with brilliant stag party ideas. Get your Hands on a Grenade Mug! Fancy entering yet another gadget competition? Of course you do! 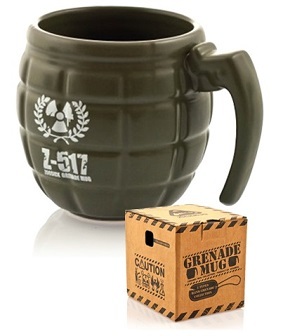 Especially since this week's prize is one of our most popular items of all time - the magnificently manly Grenade Mug! We've sold a lot of these during our reign as the best gadget website in the world, and we're sure that you're already feeling a little bit ashamed of the bland, boring mugs that currently populate your kitchen cupboard. Why do you deserve a cup of tea this week? Perhaps you've been rescuing kittens from trees, or building furniture, or just putting up with your demonic monster of a boss. Tweet your answer to @Gadget_Inspect, and the grenade mug will go to the most deserving entrant. We'll tweet the winner at 1pm on Friday the 5th of July. And if you're not on Twitter...you're behind the times. Sign up today or risk becoming obsolete!